The good folks at Audio Plus Services, the North American representative for Micromega, have lent me their new almost entry level DAC. I say “almost” as it’s not spendy enough to make it into my DAC survey, but yet inexpensive enough (US$370 on Froogle) to compete with all but the bottom feeder products out there. Stay tuned, more as I get into it! There seems to never be enough midpriced DACs out there for your dancing and dining pleasure. I’m up to 89 now! 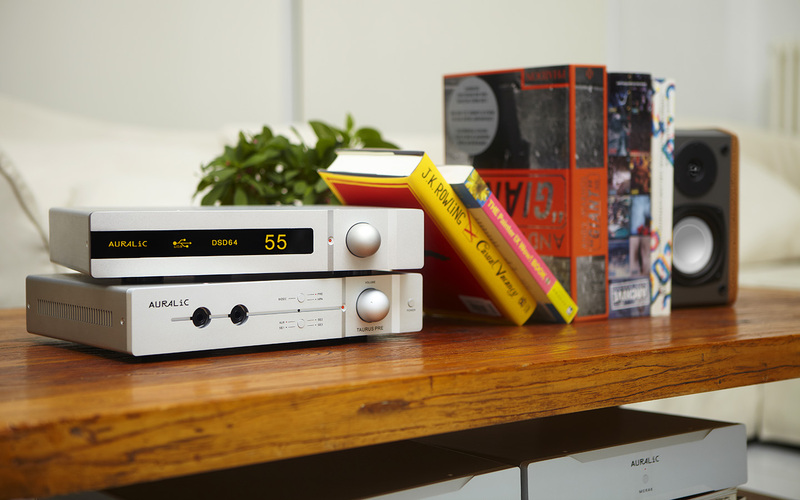 An example of one of the new entries is the DSD-capable ARK MX+ DAC from AURALiC. In related news, the 13th edition of Hifi Zine is out, and I have a piece in there about EQ plug-ins for audiophile players…Check it out. I’m up to a frankly incredible 86 DACs in my list of mid–priced DACs. In related news, the 12th edition of Hifi Zine is out, and I have a piece in there about shopping for DAC. It’s a 10,000 foot view, but you may find it interesting. An example of one of the new entries is the very capable X-Sabre DAC from Matrix Digital Audio. P.S. – Let me know if there’s a DAC in the $500 to $2k price range that I’m missing…I’ll add it ASAP! I want to again thank everyone for coming out to the session. I had fun, and I hope y’all enjoyed it as well! Around Black Friday, I put together a survey of some mid–priced DACs to use with your computer and hi–fi system. Since the original posting, I’ve found a few more to add so, instead of updating the original post, I’m going to continue to update the stand-alone table; one chart to rule them all! Let me know if you have a correction or suggestion…If it’s within the US$500 to $2000 price range, I’ll add it! My advice for an ideal configuration based around and iMac would be an iMac 21,5″ ( i5 2,9 GHz), with the cheapest internal “normal” drive you can buy. Here in the US, that means a 1TB, 5400 RPM, Serial ATA drive. Then, buy a big SSD (I like the 240 GB OWC Mercury Electra 6G at MacSales.com), remove the 1 TB internal drive, and replace it with the SSD. Now you’ll have a fast Mac, which will serve you longer as things inevitably need more compute power over time, and a fast SSD internal boot volume. If you partition the SSD, you can have your dual boot version; one partition for day-to-day work, and the just other for audiophile enjoyment. Drop the 1 TB rotating media factory drive that came with the Mac into an external case, and use it as your Time Machine volume. OWC also sells their On-The-Go Pro “Add your own Drive” enclosure kit, which is perfect for repurposing that factory drive. The minimum factory complement of RAM is 8 GB, which is fine for most work, including file-based music playback. If you’re rich you can always swap it later for more…Combine that host with an external volume or RAID (you need to protect your music library, don’t you?) to store your music and, wow, you have a very nice host! It’s Black Friday and, at least in my neighborhood, it should be White Friday. It started snowing late yesterday afternoon and, by this morning, we had a nice white covering. This weekend, it’s your duty as a conspicuous consumer to go out there and do your part for the economy so, I’ve got a little survey of some mid–priced DACs to use with your computer and hi–fi system. By now, you probably know that a DAC, or Digital Audio Converter, is a hardware device that converts digital audio, in any of several forms, into analog audio that our analog ears can listen to. You probably already own one…Your cell phone has a DAC in it to turn digital voice data into a conversation with your better half or the pizza delivery man. Your computer already has one, either in-built or as an add–on “sound card,” to get audio out of the box. This collection of DACs are for those handful of us who want something better than motherboard audio for their music and are willing to fork over more than chump change to get it. …took a heckofalot o’ time, almost a month. I’m more than happy to report that the hardbound version of To Serve & Groove: A Comprehensive Compendium of Numerically Disposed Mellifluous Servitude is out and in the wild. About 200 pages, a perfectbound A5 (148 x 210 mm or 5.8 x 8.3″). Color cover, black and white interior. An edited version of this article was first published as Product Review: Soundmatters foxLv2 Hi-Fi Bluetooth Speaker on Blogcritics.